Waste hauliers Cleansing Service Group (CSG) have taken delivery of the latest consignment of new road tankers purchased as part of a multi-million pound fleet investment plan. The five 32 tonne Scania ADR pet-regged vehicles, specifically equipped for liquid waste removal and transportation, will be put to work removing oily waste from petrol forecourts and clearing aqueous waste from industrial sites. 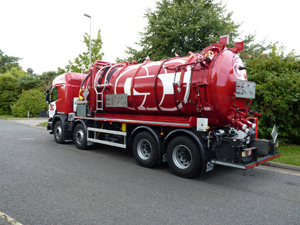 Liquid waste removal and treatment is one of the company’s core activities and CSG already operates the UK’s largest fleet of specialist vehicles to collect all types of aqueous wastes including sewage, oil and water, sludge, acids and alkalines and grease trap arisings as well as clearing ponds and lagoons. Forecourt clearance is a growing part of the company’s business, and its tankers empty and maintain drainage systems at around 2000 forecourts each year. The new Whale tanker equipped vehicles, purchased outright, incorporate sleeper cabs and handwash facilities, weigh cells so that customers know the exact weight of waste taken away, and water jetters with 30 metre hoses. The next vehicles to come on stream are three 26 tonne Scania vacuum tankers, five 18 tonne Daf vacuum tankers for sewage clearances and a small 14 tonne Daf vacuum tanker for working in confined spaces. They will complete a current spend of £2 million in this year alone. The Fareham-based company is planning to spend over £10 million over the next seven years on a tanker fleet replacement programme. Over 100 of CSG’s fleet are specialist waste road tankers reflecting the company’s long historical links with the liquid waste sector. CSG believes its fleet investment programme will provide additional capacity for business growth and enhanced customer service and create one of the most modern and environmentally efficient tanker fleets in the UK.